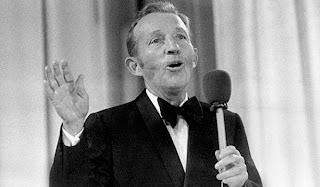 When Bing Crosby died in 1977, I was only three years old - so I did not appreciate the significance of what Crosby did for popular music and other genres of entertainment. However, now that he has been my favorite singer and entertainer for years now, I remember his death, October 14, 1977, more than I do some of my own relatives. Bing's passing left a huge hole in the entertainment world that has never been filled. Bing was a busy man in his final days, and days before his death no one would know what was about to happen. Bing had just completed a two-week engagement at the London Palladium on October 8, 1977. He gave one more concert on October 10 at the Conference Center in Brighton, England. On October 11, he recorded eight songs and an interview for BBC radio in the morning, along with a photo shoot that afternoon for the album jacket of his recently completed "Seasons" album. Also on October 11, he dealt with the police, upon discovering his London flat had been broken into and robbed during his concert in Brighton. On October 12, he played 11 holes at the Cranbrook golf course in Kent (a course which he was interested in buying) before returning to his London flat for a late afternoon interview with a journalist. Then early on the morning of Thursday, October 13, he flew from London to Madrid for a four-day recreational weekend of golf and hunting. La Moraleja golf course is located in the La Moraleja residential complex, 8.8 kilometers (5 1/2 miles) from Spain's capital along the Madrid-Burgos national highway. The club was founded in 1975 and originally comprised an 18-hole golf course, a smaller itinerary of nine par-3 holes, and a putting green and practice ground, all designed and supervised by the famous American golfer Jack Nicklaus. Bing wasted no time upon arriving at La Moraleja on October 13 in getting out on the links. he was paired with the World (at the time) and Spanish Gold Champion Manuel Pinero. Their opponents were Cesar de Zulueta, President of La Moraleja, and Valentin Barrios. Pinero and Bing lost to de Zulueta and Barrios for that match, with Bing carding a 92, but they were confident the 14th would be their "lucky day." The manager of the golf course, Valentin Barrios, lunched with Bing, Manuel Pinero and Cesar de Zulueta prior to the golf match on Friday, October 14. For Bing's last meal, he ordered only a cup of chicken broth, a ham-lettuce-tomato sandwhich, and a glass of water. He said that most of the conversation during that lunch centered around Saturday's planned partridge hunt. Bing was very particular about the type of rifle he wanted to use for the shoot. Several different types were shown to him, but Bing would only settle for a 20-gauge. It had to be this or nothing! Bing took this partridge hunt seriously; he even bought a $700 wardrobe for it, including a jacket, pants, hat, leather lace-up boots, thick handwoven socks and a full range of accessories. Sadly, he would never get a chance to wear them. Following the partridge hunt, Bing had planned on flying to the island of Majorca for more golf before returning to California. He was planning to meet with record producer Ken Barnes upon his return home to routine songs for a planned duet album with Bob Hope. Following lunch, Bing spoke to journalists in the clubhouse in what turned out to be his final interview. He was in good spirits and reminisced freely about his long show business experience. He said the movie High Society, in which he starred with Frank Sinatra, Grace Kelly, and Louis Armstrong was "the most satisfying one of my career." He described his trip to Spain as a test of his recovery from the back injury he had suffered March 3 (a ruptured disc caused by a 20-foot fall from a Pasadena, CA stage). He went on to say he was looking forward to teaming again with Bob Hope and Dorothy Lamour in The Road to the Fountain of Youth. Valentin Barrios recalled Bing's final round of golf for Francisco: "He played very well, and I know he enjoyed it very much. He told us he was feeling much better after his fall in California a few months earlier-and better still for being out on this beautiful golf course. He told me about some of his golf games as we played, about games with great pros like Ben Hogan, Gene Sarazen, Sam Snead, Gene Littler, Arnold Palmer, and Jack Nicklaus. He told a lot of little stories about each of them. "Jack Nicklaus was his favorite, and I remember him telling me they planned a father and son match between them in a few weeks. Mr. Crosby said he was glad to have known all these great golfers. He was in good spirits; we joked about his white sun hat and old red cardigan. He was very relaxed, even at the second to last hole, when the score was even and he hit one into the sand trap. But he never lost his cool-still humming and whistling at the last hole. "I remember he scored an 85; he and Manuel won by one stroke because of Bing's handicap, which was a 13, I believe. Bing collected his ten dollar prize before headed back to the clubhouse. I remember, too, that he had a new set of Ben Hogan golf clubs for the round, but still used an ancient Hogan putter, which must've been his favorite." Mr. Barrios then offered a never before told story, recalling that last song Bing ever sang: "There were some construction workers building a new house just off from the 9th hole. The workers recognized Bing and motioned for him to come over to them. Bing was very happy to be recognized and walked over to the men, who asked for a song. 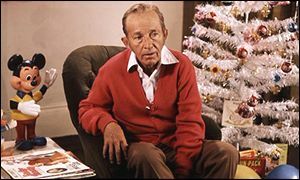 The last song Bing Crosby sand, which I remember vividly, was 'Strangers In the Night.'" It is unclear whether Bing voluntarily chose to sing this song or if he asked the workers what they would like to hear and they chose it. "The next minute (around 6:30 p.m.), he fell face down on the red-brick path, landing on my foot when he fell. We turned him over; he was very pale and had a large red bruise on his forehead from where he hit the ground. He died at my feet. I knew he was dead right away-died instantly. "We carried him into the clubhouse and summoned the house doctor (Dr. Laiseca). We called for an ambulance, just to make it look like he died en route to the hospital and not at the golf course. We all knew he was gone before the ambulance ever arrived. "I couldn't believe it. I never would've imagined he would have a heart attack. He showed no signs of being tired or in pain or anything. All at once, he dropped dead. I'll never forget it."